Rotary Kilns vs. Rotary Dryers: What’s the Difference? To the layman, the term ‘thermal processing’ might not mean much, but the truth is that everybody in the developed world has benefited from it in some way. It is responsible for much of our canned goods, for example. Thermal processing on an industrial level is also heavily involved in the production of cement, lime, titanium oxide, and other substances. So, even if people don’t know it, the thermal processing industry lies at the heart of modern life and society. This means that providers must adhere to very strict standards and use only the finest tools and equipment. Two of the most important are the rotary dryer and the rotary kiln. While they are often talked about interchangeably, there are some key differences. 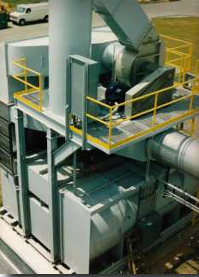 Keep reading to learn about the purpose of rotary dryers and kilns and why they are so valuable for thermal processing. Sometimes, the terms ‘kiln’ and ‘dryer’ are mixed up during discussions about thermal processing. They involve similar conditions and work towards similar objectives, but treating them as one and the same can lead to confusion, particularly when purchasing equipment. For instance, rotary dryers are capable of drying products and substances, but it is not what they were primarily designed to do. They are much more efficient at extracting moisture from materials. Rotary kilns, on the other hand, are concerned with both heating and drying. Kilns achieve a desired state of dryness by raising substances to extremely high temperatures (between 1000º and 3000ºF). This triggers chemical reactions, and new products can be created. Lime, alumina, cement, and iron ore pellets are all made this way. Rotary dryers, despite their name, are rarely used for drying alone. In fact, one of their main uses is the packaging of canned goods. If all of the moisture inside ingredients is efficiently removed, it is much harder for bacteria to proliferate and cause the food to rot. Rotary dryers operate at a lower temperature than kilns (between 800ºF and 1400ºF). They are still built to be incredibly sturdy, but kilns must be substantially tougher. They need the capability to withstand extreme temperatures, often for prolonged periods. Consequently, high-quality kilns are usually lined with a brick or other castable interior. It protects the steel shell from damage during thermal processing cycles. You’ll find that rotary dryers are normally unlined, but the drum still needs to be made out of a heat resistant metal. Regardless of whether you need a rotary dryer or a rotary kiln, the quality must be very high. If you want to create premium products, you’ve got to use the best equipment. The choice depends on how you wish to change your materials. If heat and drying are handy perks, rather than the top priority, rotary drying is probably the optimal technique. Canning is a good example. The heat is just necessary for drawing out moisture. It doesn’t do anything special to the material or cause any chemical reactions. Conversely, if it’s a high-intensity chemical change or transition that you’re looking for, a rotary kiln is what you need. For many industrial operations, it is the simplest way to break down substances and force them to form alternative bonds. This is how new materials are made. If you would like to know more about thermal processing and where to buy quality equipment, contact HiTemp. Or, call +1 (908) 500-7500 to speak to the New Jersey team and discuss your needs directly. Contact us today using our Contact Form, or by email or phone to discuss your needs. Copyright © 2018 HiTemp Technology LLC. All rights reserved.